For those in the Church who find their apprehension of truth to be somewhat dim and obscured, Horatius Bonar’s cogent letters will shed the light of the Gospel anew. 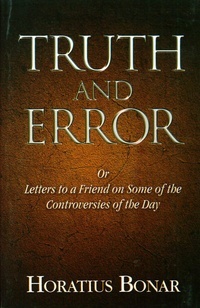 Bonar recognized that truth is not mere mental assent, but wrought with moral and spiritual implications. More than anything, Truth and Error exhorts us to love the truth, thereby models for us the needed labor of fanning its flame. Those who take the pages of this book will be altered to the urgency of the task ahead.